According to recent reports in the tech press, shortages of the Nvidia GTX 690 are due to scarce availability of a bridging chip used in the graphics card. The PEX8747 PCIe 3.0 bridge chip is a critical component of the card and at present the only company that manufacturers them is PLX technology. 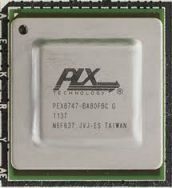 A few companies grabbed all the initial allocations of the chip from PLX leaving others with very little. The part is currently listed as 'out of stock' by PLX with dates of the next big production cycle not yet known. The chip is also used in a variety of high end motherboards (Asus, Gigabyte etc) to increase the number of PCIe slots and is also intended for AMD's new Radeon HD7990 dual-GPU graphics card. AMD has the choice of either developing it's own equivalent PCIe 3.0 bridge chip, switch to a PCIe 2.0 chip (which will reduce it's product specifications) or simply wait for PLX to eventually supply them with more chips. Either way, it will take time which will effect manufacturer's production schedules.